Experiment Cats, boxes, laser pointers and behaviour. First thing I would like to do is thank you for your assistance and time in this experiment, if you are as daft as I am and take part in this fun experiment. 4 As much time as you like, but it may involve a few days wait. 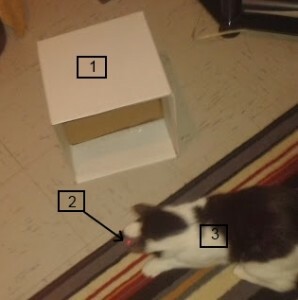 Place the cardboard box in a prominent place that your cat can get to. OK I do understand that there are not many places a cat cannot get to! but the object is to allow your fluff ball to adopt the box as bed, play toy or whatever, now you obviously have a cat so therefore you already understand the amount of time for your little darling to adopt the box is directly inverse to your desire they should do so, and there is a very good reason for this…. because you have a cat and not a dog, shouting ‘get in the box’ to a cat is never going to work. Once your cat has accepted the box start playing with the laser run it everywhere you think you cat can get to without it costing you in damages, then play the laser INSIDE the box. Does your cat chase it into the box? Does you cat go into ‘attack posture’? Does your cat just stop and watch? Or does your cat react in a different way. My cat and I have been playing with a laser for a few weeks now and although I had noticed something early on I think maybe I had dismissed it for the wrong reason, I assumed that she would not follow the red dot on top of her play tower as, with her on the top level it does move around a lot as she does, however today when I was playing it along the carpet she was everywhere like a rash, but she came to an instant stop when I played it into her box (see this page for explanation about ‘her’ box Cats on Humans). I tried this a few times over the next hour or so but always with the same result, she would not follow it into the box. This got me to wondering if it is just my cat or are other cats the same about attacking something in their bed, so with your help I hope to find an answer to my question. There has been at least one death attributed to excessive laughing.